In this update we summarize of some of the material most recently presented by the Food and Drug Administration on the Food Safety Modernization Act (FSMA). 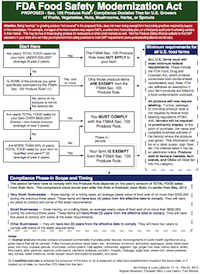 Also find a compliance decision tree for US growers of fruits, vegetables, nuts, mushrooms, herbs, or sprouts. This rule will impact most growers in New Jersey. If you have questions do not hesitate to contact Meredith Melendez or myself.